Before you begin the process of getting your PMP Certification you should read the Project Management Professional Credential Handbook and visit the PMI.org website for additional information. Take our PMP Course to satisfy the required 35 hours (PDUs) education requirement. 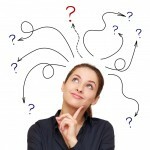 Take the PMP Exam : The PMP Exam is 200 questions with a 4 hour time limit. The questions are broken down into 5 process groups; Initiation(13%), Planning(24%), Executing(31%), Monitoring and Controlling(25%), Closing(7%). Before you take the exam, download this guide containing secrets to help you pass. The Project Management Institute requires that you meet some initial requirements before you are eligible to sit for the PMP exam. 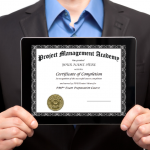 Get PMP Certified. Get Ahead. Are you ready to start? See how Project Management Academy will get you prepared. If you are still unsure, here is a great article that talks through the PMP certification eligibility requirements in detail and gives you some next steps: Do You Qualify for the PMP Certification? Find out if you might be eligible to sit for the PMP exam.